Is this the best film ever? Paul Thomas Anderson is quite possibly the greatest living director working today, so after five years since his last film (which many believe to be his best) There Will Be Blood, Anderson returns with The Master starring Joaquin Phoenix and Phillip Seymour Hoffman. The anticipation and high expectations surrounding this film are greater than most blockbusters that are soon to be released but is The Master a great and monumental entry into the world of cinema or just another film you’ll forget the minute the credits roll? 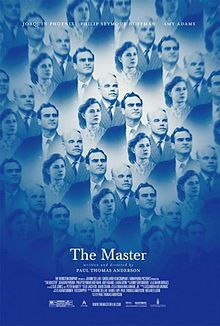 Joaquin Phoenix stars as Freddie Quell, a naval veteran in World War II who struggles to function in the world. His random violent outbursts and alcoholism prevent him from interacting with people on almost any level. It’s until one faithful night that he meets Lancaster Dodd (Phillip Seymour Hoffman) a wealthy family man who takes an interest in Freddie. Lancaster takes Freddie in, knowing he has no real home or family and involves him in what’s only referred to as ‘The Cause’. A religion of sorts that resembles a cult more than anything else keeps Freddie occupied whilst his friendship with Lancaster grows into something more like a father/son relationship. Peggy Dodd, Lancaster’s passionate wife becomes all the more concerned about Freddie and his erratic and unpredictable nature whilst at the same time defending ‘The Cause’ in any way possible. To say any more about the story or characters would be worse than any insult you could think of. Even with the expectations I had for The Master, in hopes that it would be a visual feast filled with rich and complex characters by one of the masters of cinema, I can say that the film even exceeded those anticipations and expectations. This is Paul Thomas Anderson’s most challenging film yet with the character of Freddie whom we follow throughout being someone no human being would ever want to encounter, his behaviour at times make investing in his character difficult. Lancaster on the other hand is the person you could easily spend time with and listen to every word they say. Their characters aren’t instantly accessible ones but their bond is beyond words, despite their appearances their personalities aren’t so different. One scene involving Lancaster almost interrogating Freddie makes for one of the most emotional moments in cinema of this year or any year, it’s at this moment where your dedication to these characters instantly pay off. Paul Thomas Anderson is best known for Boogie Nights, Magnolia, Punch Drunk Love and There Will Be Blood, four masterpieces that allow damaged and/or inaccessible characters to drive the story. We fall in love with them, we understand them, we see glimpses of sadness and love in their struggle for power and happiness it’s this and an infusion of creativity and originality that makes his movies what they are. In saying this is his most challenging film means the protagonist isn’t one we can register with from the get go, the Freddie character may be his most damaged yet proves to be one of his most complex. The performances by Phoenix, Hoffman and Adams are the best of their careers, especially that of Phoenix, you’ll instantly forget him as an actor but rather as Freddie from the first moment you lay eyes on him. It’s not a performance, it’s a transformation. The score is also quite flawless, giving each scene it’s heard a real sense of wonder, menace and ultimately melancholy, once again, it accompanies the emotional filmmaking and performances on display. To challenge the audience with characters such as these is what movies are meant to do, it’s easy to make someone nice and lovable, the real trick is making us care for someone we’d run from if we ever saw them on the street. To put it simply, The Master is one of the greatest films ever made. Its magic, complexity and honesty are the reasons why we endure and love cinema, to challenge our psyche and feel something no words can explain. See it on the biggest screen you can and be reminded why cinema and the magic of movies are what can define this odd thing we call life. You may also want to have a peek at these reviews: The Girl with the Dragon Tattoo, Underworld: Awakening,Skyfall.